With the cool Roman brickwork and awesome limestone (we think that is what it is!) around the entire house, we currently have two lame(!) exterior doors we like to be more period-appropriate. The first one that you see when driving up to the house, is the front door. I'd like to forego a storm door on this for the fact that they aren't the prettiest. And since it's a little recessed, that will help keep the elements away from this wooden beauty! I was pretty darn set on The Allandale (bottom right photo) before we closed on the house, but after having K. Holly Studios take photos of the house, and me uploading them into Crestview Door's Door-O-Vision, I have four that I like. I was leaning towards The Allandale because the windows mimic the brickwork around the house, but now I'm leaning toward The Fortuna because it offsets it a wee bit. What are your thoughts? I'd love to know! Also, as far as color goes, we are thinking a little darker stain than this "honey" version, but lighter than the "espresso" which was their other option. Our wood floors will be a very light brown (we are thinking walnut right now), so I'd love for it to coordinate with that. The second exterior door is actually in our bedroom, and I'm having trouble figuring this one out. I want windows in it as well, but I think I'd like a storm door, since I'd love to open it (and keep locked) for a cross breeze in our bedroom on nice evenings. I'll keep you posted on this one! I like the first option because then you can hide behind the door more easily if its someone you don't want to answer for! And it goes well with the windows in the garage door. I like them all but I feel like the horizontal lines on #1 and #4 flow better with the house's lines. Can't wait to see what you pick! Oooh I like the Fortuna, top right! This is so fun and exciting! Can't wait to follow along and then be totally jealous of the end product. As for the doors, I think I would go with the Bellevue. I like the Langston for the combination of privacy and mimicking the lines of the garage. Good luck! I like the Langston for both the privacy and the way the lines mimic the garage. I voted for the Fortuna! Definitely the Bellevue! I'm jealous; my grandparents were both born and raised in Grand Haven and we spent many happy summers there. Would love to own a MCM cottage there!!! Good luck / happy remodeling. 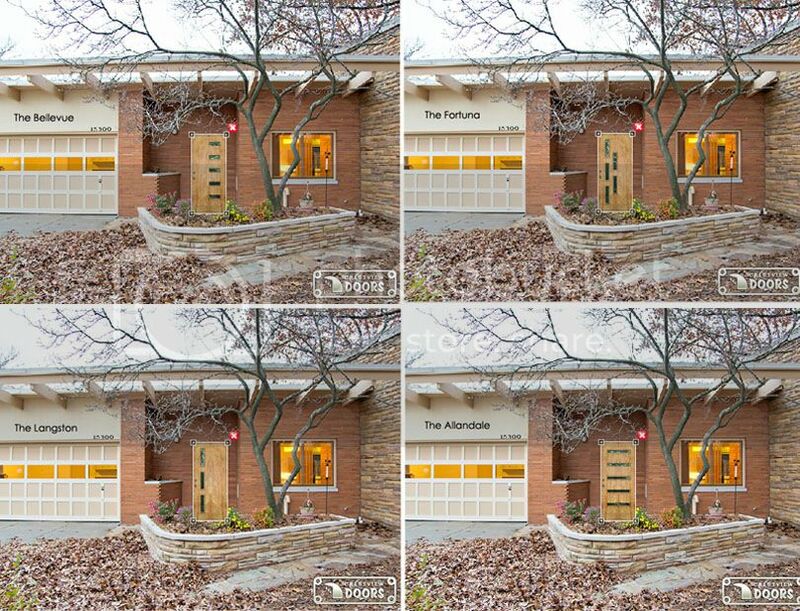 Regarding door color, I honestly think your house could use a little contrast. There's a lot of neutral there, and wood floors will be neutral, and it might be nicer for the door to complement the floors. Maybe a bright, or deep color? Olive green? Turquoise? Prussian blue? Zoe - regarding the door color. BELIEVE ME, we have thought of doing a color, but when it comes down to it, we are very plain people. I love the idea of having a wooden front door, and then doing some great accessories in some great color - like planters, actual plants, maybe some great chairs to the right of the door. I don't think I'll be able to bring myself to paint the wood right off the bat - and then regret it later! Yeah, I wouldn't want to paint the wood either. My point wasn't so much about adding color as contrast, but you have a good eye; I'm sure it will work out. And do let us know which door you end up with!